This is how the cupboard looked when I first saw it in the back of an antique shop. The owner wanted me to restore the piece. It had several coats of paint on it. The feet had half rotted off, the crown molding was missing as were the doors, and the cupboard had been sawed into. The ends were originally one board. To strip it took 40 hours, three gallons of stripper, and three gallons of Acetone. When I had it stripped down to bare wood I realized that some time in the past that it had been refinished with a belt sander. The original wood surface with patina was Gone. Had I known this I would have taken it to someone that had a stripping tank. This is only the second antique that I have ever had to sand out because of the course belt sanding marks left on it. The mate to this cupboard can be found on page 188 Fig. 232 in the book “Art and Mystery of Tennessee Furniture”. That one was made out of walnut and is dated to 1790 – 1820. This one is made out of cherry but they were both made in the same shop. 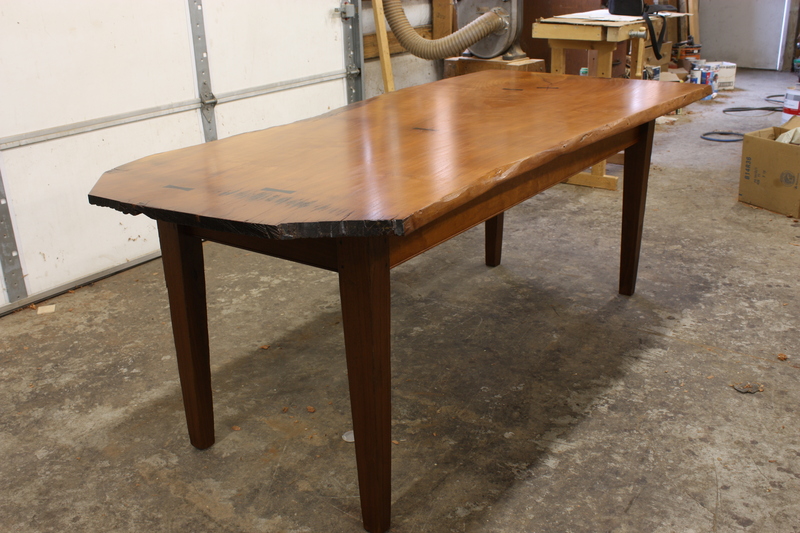 I used old lumber to restore this with. I restored the bracket foot base, made new doors, and crown molding. The total time to restore this piece was 138 hours. This is a style that I have not worked in very much. A friend had been on to me for a couple of years to build a mantel for him. When he showed me a picture of this I fell in love with it. I found some curly red oak for this project. The back board is curly English brown oak. The fans on the pilasters are chemically stained. I used a lock miter to build the pilasters. I spent a lot of time turning the boards over and end for end to get the best reflection out of this curly oak. It took 150 hours to build this mantel. This is a mantel that I designed and built for a client. 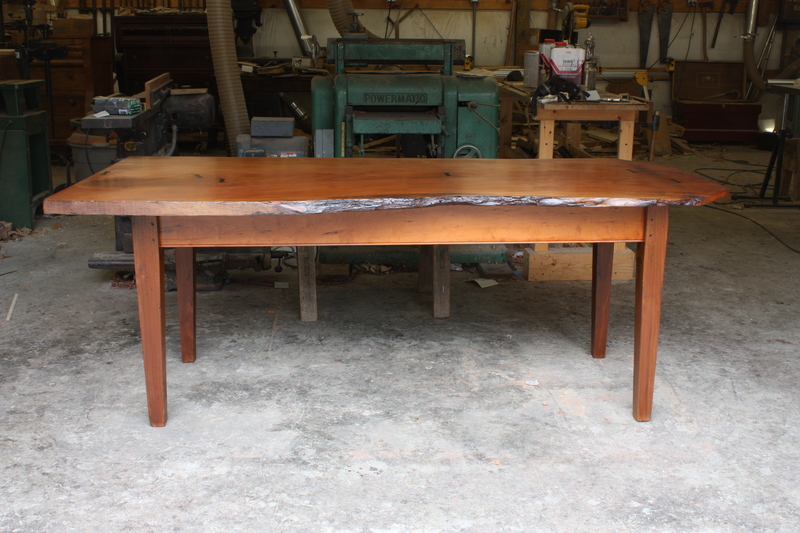 It is made out of curly cherry that the client furnished so it would match the rest of the interior floor and moldings. The brick work originally just stuck out into the room and didn’t go to the ceiling. They asked me to build the wall out . Building the wall out took 10 hours. The reeding is curved not flat. I made a scraping tool to produce the reeding with. It took 201 hours to build this mantel. One of my clients brought me a 6′ diameter mill wheel that had been sitting the dirt for years and a third of it had rotted away. It was made out of popular which is prone to rot if not keep dry. This wheel was a pulley in the mill. It took 62 hours to rebuild this . This tall case clock was missing the pediment on top of the bonnet. The client had found a brass cherub that he wanted included into the new pediment. The challenge was to design a pediment to match and flow with the existing moldings and carving of the clock. When I finished and sat the pediment in place the client, a clock repairman , and I stood there in amazement because all three of us saw how well it matched the rest of the clock. This pediment took 57 hours to complete. 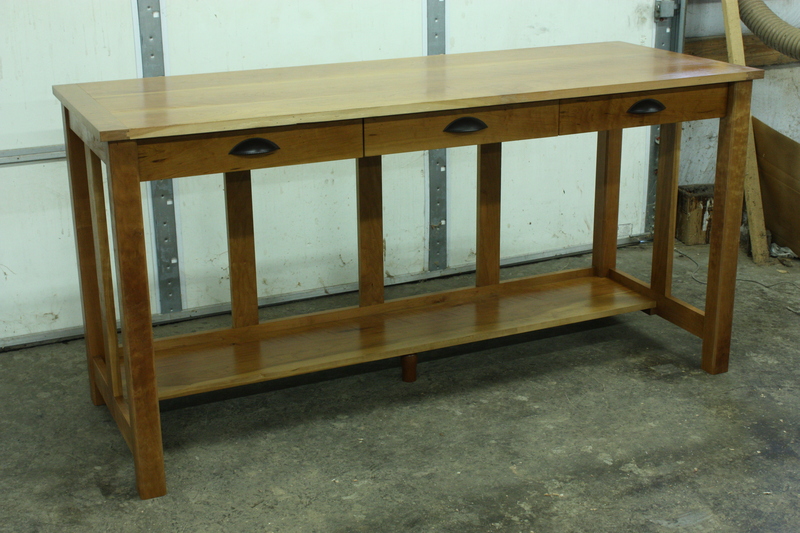 This is a recently finished commission in cherry. 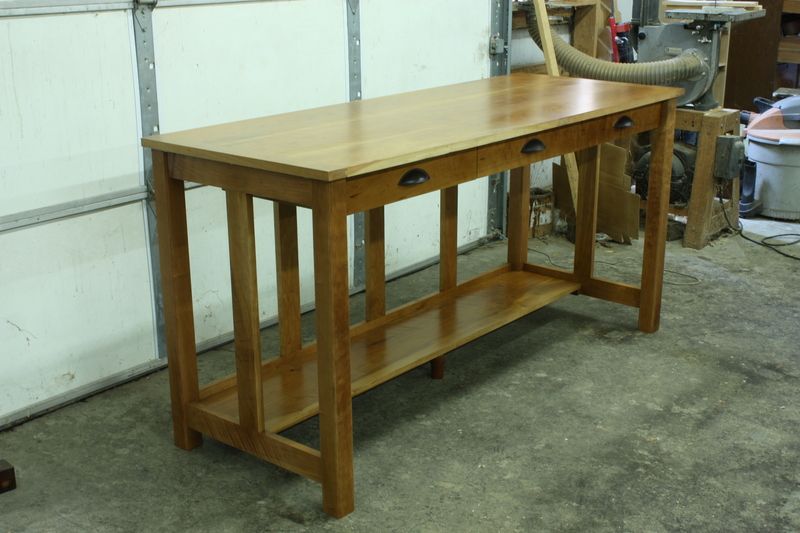 The clients wanted a worktable in their kitchen. Also they wanted saw marks to show and sapwood left in the boards. I ask him to come over when I was planing to tell me when to stop so he could have the saw marks left. The cleats on the top or as some call them breadboard ends have four deep tenons into the cleats. The tenons are dead tight in thickness and are only glued on the inside of the center tenons. In width the sides of the tenons are cut loose to allow for expansion and contraction . The dimensions are: Height 36″, Width 72″, Depth 28″. This commission took 90 hours to complete. There is a great new woodworking store in our area. Klingspor long known for high quality sandpaper has opened four new woodworking stores in North Carolina. Just about anything for the shop, tools,router bits,exotic lumber,finishing supplies and much more they have in stock. They are friendly and helpful, just good folks to deal with. The closest store to the Tri-cities is just south of Asheville in Fletcher N.C. . I know you’ll enjoy their store as much as I do. About this time of year, in July 1974, I started full time work as a cabinetmaker. That was 40 years ago. I’m blessed in that I absolutely love what I do in life and where I live. Wood is a material that is very unique not only in it’s grain, color, and texture but it is an organic material with a soul or spirit to it. To the Daoist everything has Qi which is the life force. Even after the wood is cut there is still Qi in it. When working with the wood my Qi and the wood’s Qi mingle in a dance that that is really extraordinary in the results. The most visible of which is beauty , harmony ,and proportions. These are the basics of classical art and architecture which are derived from nature. My first shop was in Knoxville, Tenn. . It was small 600 sq.ft. you didn’t have room for two cat to dance in that shop. But some pretty amazing pieces of furniture and work came out of that wee shop. As that valley where my house and shop were grew with subdivisions and noise I still had a beautiful view to the Cumberland mountains. I moved to Flag Pond, Tenn., population 850 souls, a little over nine years ago to study Traditional Chinese Medicine which is my second love in life. I’ve used Chinese Medicine for all of my medical needs for the last nineteen years and will continue to use that unless I need surgery for something. When the school closed because of financial trouble I decided to build the shop that I had always wanted. The new shop is 2,500 sq. ft. and sits by a creek up here in the mountains. All that I can hear in either the house or the shop is the sound of the creek running and the clocks ticking. There have been good times and hard times over the last 40 years but I wouldn’t trade the way I’ve spent it for anything. This art, craft,and trade is a way of life for me. I see my time growing shorter at 64 years now but with any luck here is to the next 20 years. Also a word of thanks to all of my old clients, present clients, and new clients yet to be for making all of this possible. 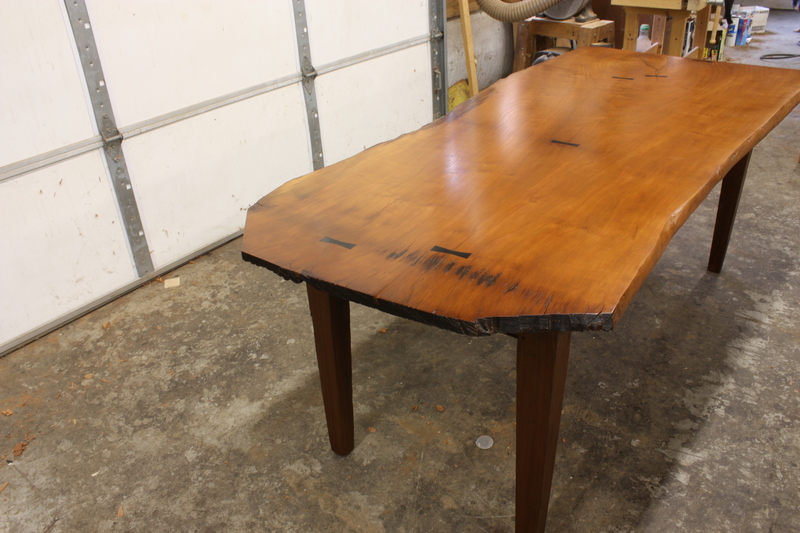 Here are three views of the finished table. This is going into my friends library/music room. The dutch-man keys are Ebony that were placed into cracks to reduce further cracking. A dear old friend has asked me for years for one of my wide boards. He knew the story of my lumber. That is was all cut before 1934 in the region of our mountains that was to become the Great Smoky Mountain National Park. 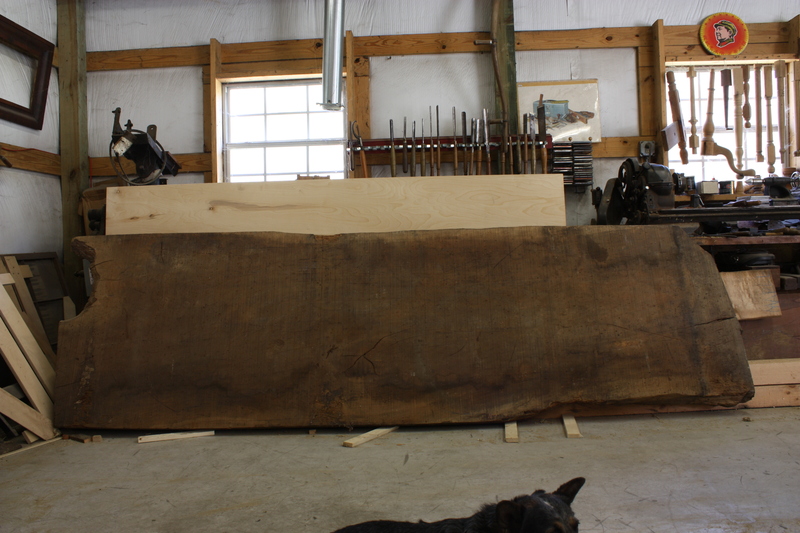 This lumber was cut sometime between 1930-1934 by the Little River Lumber Company. Bob Emmitt whom I studied with was privately employed by James Van Derventer to build furniture for him. They knew the park was coming in and that would be the last of the timber to come out of the region. So Bob Emmitt and a helper were sent up to Townsend, Tennessee to buy the lumber they needed from the Little River Lumber Company. Bob said there were stacks of lumber three stories high and he would just stand there studying the ends of the board. By studying the ends he could tell which boards came from the same tree. He wanted the lumber to match in color and grain. But two boards caught his eye. 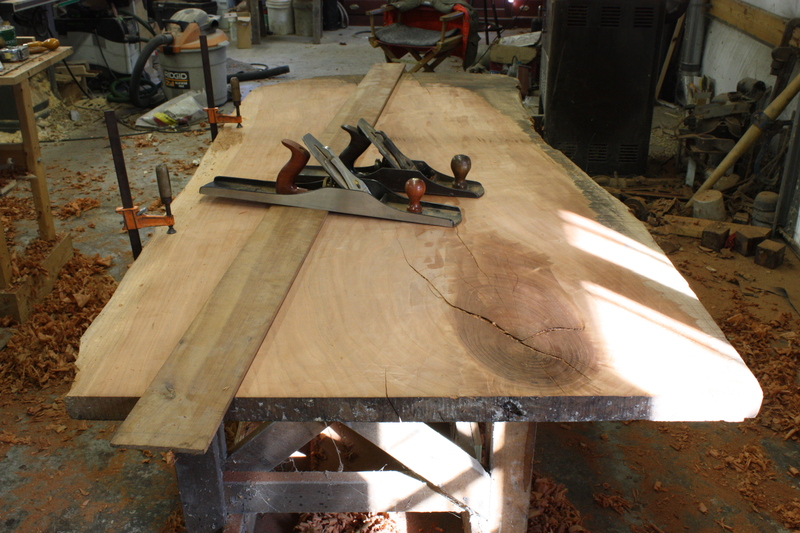 They were cherry from the same tree and 39 1/2″ wide without the heart of the tree in either board. 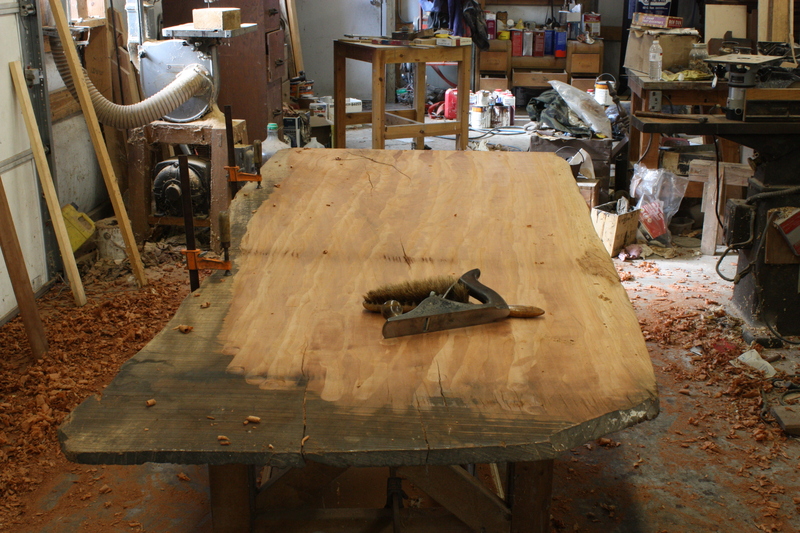 Bob later used part of one board to make a Chippendale Pie Crust Table. About seven years after Bob’s death I was able to by the lumber form Bob’s widow Peggy Emmitt. 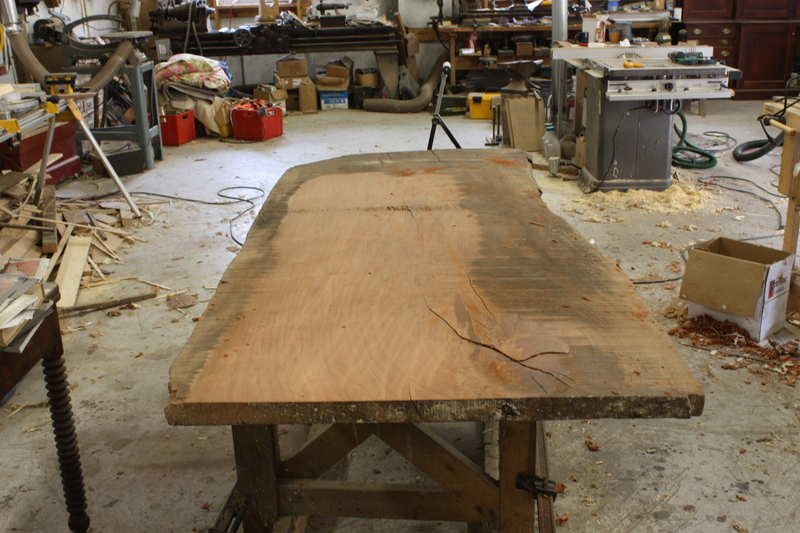 This is one of the cherry boards. The thickness goes from 2 1/2″ to 1 1/2″ x 39 1/2″ wide and 12’in length. The mate to it is what I’m using for my friends table top. This will be the top of the table. It is 1 3/4″to 1″in thickness x 38 1/2″ wide x 6′ long. Because it is so wide there isn’t a planer that can thickness it . So I started with the bow side up and with my hand planes have been dressing this side. 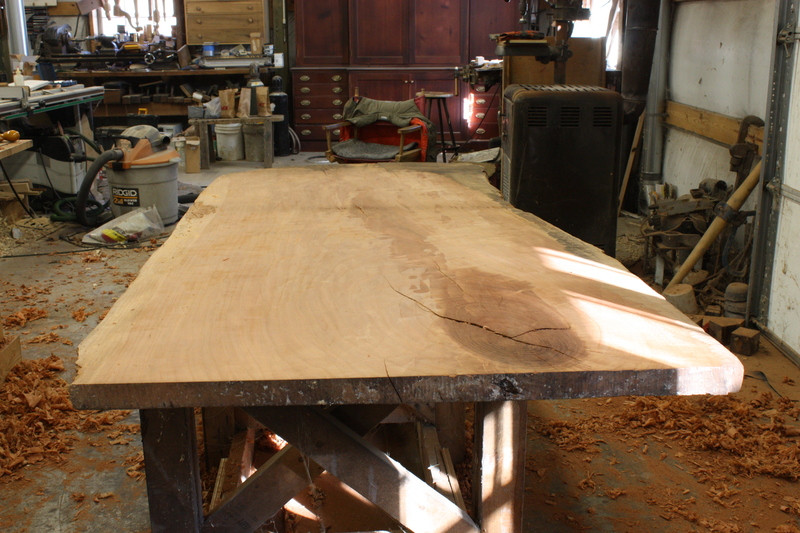 The under side will be left with the band saw marks and the far end will be left with the axe notch and crosscut saw marks. 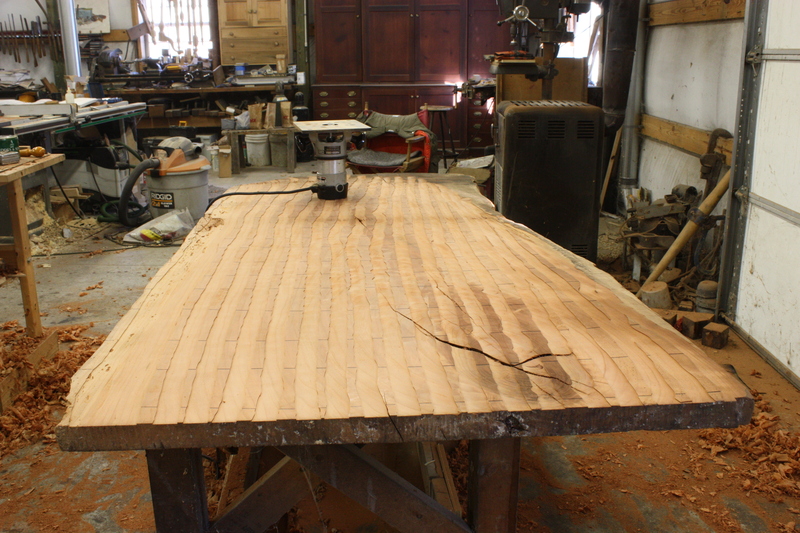 After leveling about a third with hand planes I started using a router and a 1 1/2″ bit to make a row of cut 1/16″ deep. Then I would remove every other one out with the router. The scrub plane is used to remove the ridges that were left. Notice the axe notch in the lower right corner of the board. 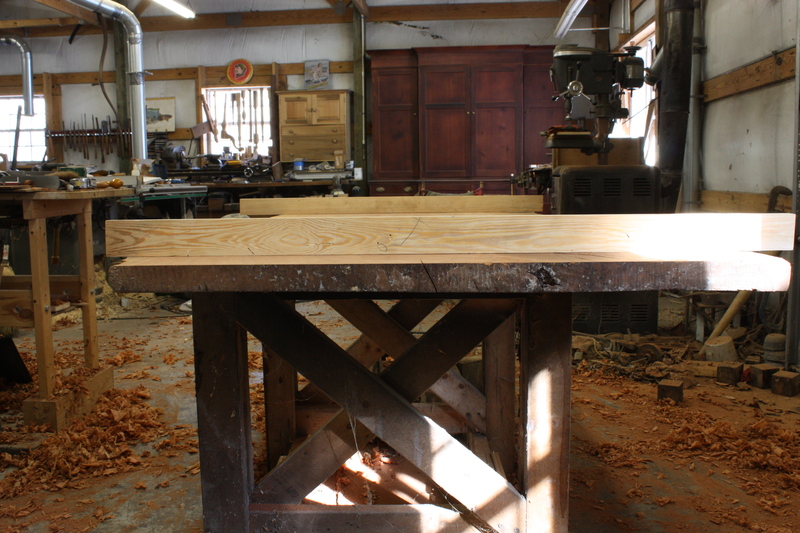 A straight edge and #6 and#7 bench planes are used to level the top again before another pass with the router. A pair of winding sticks are used to check for any twist it the top. One more pass with the router and leveling then it will be ready for finish planing. The final surface will be from the #3 and #4 1/2 bench planes. I can produce a finer surface quicker with the hand planes than can be obtained by sanding.